CHESTNUT MOUNTAIN, Ga. — On Friday morning, hundreds of parts were strewn around the Patrón Highcroft Racing Acura garage area. A new Acura ARX-02a prototype tub had just arrived at Road Atlanta by special charter from Southern California. By Saturday evening, drivers David Brabham, Scott Sharp and Dario Franchitti had driven the newly-built No. 9 Patrón Highcroft Racing Acura ARX-02a sports car to sixth overall in the rain-shortened Petit Le Mans classic, the ninth stop in the 10-race American Le Mans Series. A brutal practice crash involving Sharp left the primary Acura completely destroyed and the team’s LMP1 class title hopes in jeopardy. But a monumental effort by the 20-person Patrón Highcroft crew built a new Acura in roughly 20 hours in the Road Atlanta paddock area. The sixth-place finish extended to Patrón Highcroft team’s point lead to 21 over the de Ferran Motorsports team entering the season finale set for October 10 at Laguna Seca Raceway. The Patrón Highcroft contingent, with Brabham starting from the pit lane after missing qualifications, might have had trouble maintaining the LMP1 point lead with a lightning-fast Gil de Ferran battling the factory cars of Audi and Peugeot. De Ferran drove his No. 66 XM Satellite Radio Acura ARX-02a to the second overall position by Lap 42. But, seven laps later, de Ferran Motorsports hopes went sliding into the mud, as Gil was hit from behind by Clint Field and his Lola. The de Ferran squad repaired the Acura in only 13 minutes, but the delay hurt the team’s chances to gain points on the Patrón team. The Lowe’s Fernandez pair of Adrian Fernandez and Luis Diaz, seven-time LMP2 class winners this year, did not enjoy another winning effort this time, finishing second to the Mazda of Marino Franchitti, Butch Leitzinger and Ben Devlin. But the podium finish gave the Lowe’s Fernandez operation the LMP2 team championship and Acura the LMP2 manufacturers’ crown. Fernandez and Diaz had clinched the LMP2 drivers’ title at the Mosport event last month. The Mexican stars will attempt to tie the LMP2 season win record at Laguna Seca. Timo Bernhard and Romain Dumas captured eight LMP2 races in 2007 for Penske Racing. DARIO FRANCHITTI (#9 Patrón Highcroft Racing Acura ARX-02a): "The conditions out there were just terrible, probably as bad as I have ever seen. I nearly crashed while following the safety car. You get these rivers running across the track down to the esses. It is unfortunate for the fans. The Patron Highcroft crew is beat up after working all day and night to get the Acura ready. They did a great job." ELKHART LAKE, Wis. (Sept. 29, 2009) -- In the first SCCA National Championship Runoffs since Honda Racing/Honda Performance Development [HPD] announced the Honda Racing Line program of support for grassroots racers, Honda and Acura drivers won five of a possible seven titles this past weekend at the famed Road America circuit in central Wisconsin. Bob Boileau highlighted a weekend of outstanding performances by Honda and Acura drivers at the Runoffs, winning the Touring 3 race Saturday in his Team Honda Research-entered Honda S2000. It was Boileau’s first SCCA title, as the second-generation racer from Colorado builds on the successes of his father, also named Bob, who raced Honda Civics in SCCA competition in the 1970s and ‘80s. In addition to Boileau’s victory in his Honda Racing/HPD-supported S2000, Jim Dentici led a 1-2 Honda finish in the GT Lite race on Friday in his JTM/Ragland Racing Honda CRX, with teammate Chris Bovis finishing second, also piloting a Honda CRX. On Sunday, Dan Meller posted a dominating performance in the H Production race, starting from the pole and leading every lap en route to his first national championship in his Core Consulting Honda CRX. 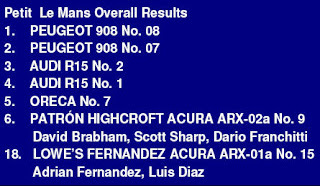 Acura was well represented with championships in two classes. Joel Lipperini qualified his RaceLabz Acura Integra GS-R on the pole in the Showroom Stock C race and went on to win his third national championship. Mark Carpenter’s championship, in F Production, was the first for the North Carolina driver and his GGS Racing team. Defending Showroom Stock B Champion Lee Niffenegger finished second this year, once again driving his Team Honda Research Honda Civic Si. Heavy rain fell just as the final race of the weekend, E Production, got underway on Sunday afternoon, but John Schmitt managed to move from 12th on the grid to a very close fourth at the finish in his Schmitt Racing Honda Prelude Si. Each year, racers from across the country compete in 70 SCCA “Nationals”, to qualify for one last, winner-take-all event in each of 25 classes: the National Championship “Runoffs”. Previous Runoffs champions include Bobby Rahal, Skip Barber, Paul Newman, Doug Peterson and Jimmy Vasser. Other Runoffs competitors through the years have included Michael Andretti, Parker Johnstone, and current Acura America Le Mans Series racer Scott Sharp. More than 600 drivers participated at this year’s Runoffs, the first to be held at the historic, four-mile Road America circuit, located 60 miles northwest of Milwaukee. Thirty-seven were Honda and/or Acura drivers, competing in seven of the 25 classes. Several Honda Fit engines, as proposed for inclusion in the FF class of open-wheel racers, were displayed outside the Honda Racing/HPD Hospitality Center in the Road America paddock. The display included the prototype Swift DB-1/Honda, an engine installed in a new Citation FF chassis, and a third 1.5-liter Fit FF race engine that has been used for durability testing on HPD’s transitional dynamometers at the company’s Santa Clarita, California, headquarters. Honda Performance Development (HPD) is Honda’s racing company within North America. Founded in 1993 and located in Santa Clarita, Calif., HPD is the technical operations center for Honda and Acura’s high-performance racing cars and engines. In addition to the new Grassroots Motorsports Initiative, HPD is the single engine supplier to the IndyCar Series and competes in prototype sports-car racing under the Acura banner in the American Le Mans Series. CHESTNUT MOUNTAIN, Ga. (Sept. 24, 2009) — Scott Sharp’s frightening practice crash Thursday at Road Atlanta has left the Patrón Highcroft Racing team scrambling to hold its current American Le Mans Series LMP1 point lead entering Saturday’s prestigious Petit Le Mans sports car race. Sharp, co-point leader with driving partner David Brabham, amazingly walked away from a horrific Turn One crash Thursday afternoon in ALMS practice when Sharp’s No. 9 Patrón Highcroft Racing Acura ARX-02a collided with a GT car and rolled violently into a catch fence that left the Patrón Highcroft machine not repairable for Saturday’s 12th annual 1,000-mile endurance classic. Sharp walked from the wreckage with parts and pieces strewn for hundreds of feet around the 2.54-mile road circuit. A replacement tub was shipped to Atlanta Thursday night from the Honda Performance Development headquarters in Santa Clarita, Calif., and the Patrón Highcroft organization will build a new mount all day Friday in hopes of taking the green flag at 11:20 a.m. Saturday. 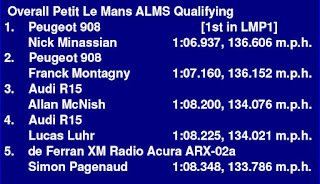 ALMS qualifying is set for Friday at 2:55 p.m. The Patrón Highcroft Racing team holds a 17-point lead in the current LMP1 class point standings over the de Ferran Motorsports Acura operation with two races remaining in the 2009 tour. Sharp, Brabham and IndyCar Series star Dario Franchitti are expected to race the new No. 9 Patrón Highcroft Acura ARX-02a prototype sports car from the back of the field in an effort to maintain the team’s point margin. The final 2009 ALMS race is set for Laguna Seca Raceway on Saturday, Oct. 10. The Patrón Highcroft Racing team was already preparing a variety of parts — bodywork, suspension, engine and gearbox — to assemble on the new tub when it arrives at the track at 9 a.m. Friday. Simon Pagenaud topped the Acura teams in Thursday’s three practice sessions in the No. 66 XM Radio Acura ARX-02a with a speed of 132.072 miles per hour, fourth overall in the 30-car field. Before the crash, Brabham held the seventh fastest overall at 129.923 m.p.h. The Lowe’s LMP2 Acura duo of Adrian Fernandez and Luis Diaz, winners of seven LMP2 class races this year, were second in the LMP2 speeds at 127.046. CHESTNUT MOUNTAIN, Ga. — Young Acura driving star Simon Pagenaud made a charge at a top three qualifying position Friday at Road Atlanta against a stellar field of LMP1 driving talent in preparation for Saturday’s prestigious Petit Le Mans sports-car classic. The 25-year-old Frenchman, with three pole positions this year, took on factory drivers from Audi and Peugeot on the 2.54-mile road circuit in search of a front-row spot for the 1,000-mile endurance classic. Driving the No. 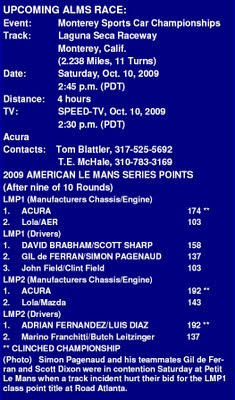 66 XM Satellite Radio de Ferran Acura ARX-02a gas-powered prototype, Pagenaud came within a tenth of a second of posting a top three grid spot against the four diesel-powered European cars. On his last qualifying lap, Pagenaud had the pace to take third overall until the Lola of Jonny Cocker ran out of fuel right in front of the de Ferran driver. Simon was forced to avoid the British driver’s car and missed a shot at besting the Audi machines. Pagenaud set the fifth-best time of one minute, 8.348 seconds with an average speed of 133.786 miles per hour. Pagenaud will co-drive with Indy 500 winners Gil de Ferran and Scott Dixon in the No. 66 Acura when the green flag falls at 11:20 a.m. Saturday. The race will be televised live flag to flag on SPEED Channel. Nicholas Minassian won the pole in a Peugeot with a speed of 136.606 m.p.h. followed by Franck Montagny in a Peugeot, Allan McNish in an Audi, Lucas Luhr in an Audi, and Pagenaud. In the LMP2 division, current class point leader Adrian Fernandez posted the third-fastest speed in the No. 15 Lowe’s Fernandez Racing Acura ARX-01b sports car at 127.428 m.p.h.. Fernandez and partner Luis Diaz have won seven LMP2 class events in 2009 and seek to tie the ALMS record of eight set by Timo Bernhard and Romain Dumas of Penske Racing in 2007. Marino Franchitti won the LMP2 pole Friday. The Patrón Highcroft Racing team, current LMP1 point leaders, did not attempt to qualify after Thursday’s devastating practice crash of Scott Sharp that completely destroyed the No. 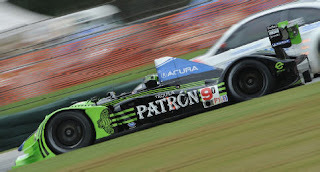 9 Patrón Highcroft Acura ARX-02a car. The team received a replacement Acura tub Friday morning and began construction of the new machine from the ground up. The experienced Patrón Highcroft crew plans to work around the clock to assemble the new Acura for drivers Sharp (who was uninjured), David Brabham and Dario Franchitti in time for Saturday’s race. ELKHART LAKE, Wis. (Sept. 25, 2009) - Joel Lipperini, of Pittston, Penn., captured his third-career National Championship in Showroom Stock C at the 46th SCCA National Championship Runoffs at Road America. 2008 Champion Joe McClughan, of New Braunfels, Tex., and Morgan Hill, Calif.-native Ali Naimi completed the podium. Lipperini led start-to-finish in his No. 81 RaceLabz/BFGoodrich/RaceShop Acura Integra LS to claim a 5.74-second victory. The race was Lipperini’s first in the Acura. “We took a gamble this year,” Lipperini said. “The car that I won my two National Championships with after driving the last couple of years I decided to retire right before this event. We built the Acura, and the first time I drove it was 15 feet into the trailer to come here. We took a big gamble, but it paid off. The car was great all week. Lipperini also collected the SCCA Club Racing Super Sweep for winning the Runoffs, the nationwide point standings, the Northeast Division Championship and one of nine key National races, each in SSC. McClughan, just eight weeks removed from quintuple bypass surgery, and Naimi spent most of the first part of the race in a four-way battle for second place. Naimi, driving the No. 14 Hoosier/Mazda/OffLineRacing.com MAZDA3 S, made one run at McClughan in the No. 36 McClughan Racing enterprises/Mazda MAZDA3 S heading into Turn Three on Lap 12. After that pass failed, Naimi couldn’t get close enough for the remainder of the 13-lap, 52-mile race. The eventual third place for Naimi was his best career Runoffs finish. Eric Van Cleef, of Huntsville, Ala., turned the race’s fastest lap and was running in second place when a transmission problem forced him out of the race with two laps to go. Van Cleef turned a race-best 2:49.975 (84.718 mph) around the 14-turn, 4-mile Road America circuit. Daniel Geiger, of Minneapolis, Minn., earned the Sunoco Hard Charger award after improving 10 positions to finish 10th behind the wheel of the No. No. 53 Hoosier/Maggiano’s/David Hobbs Honda Honda Civic Si. The Showroom Stock C National Championship race will be available on demand at ww.speedcasttv.com/scca shortly after the conclusion of the 2009 SCCA National Championship Runoffs. Chicagoland marked the start of the “home stretch” for the 2009 IndyCar championship, the first of three oval races to cap an interesting season. All three are 1.5-mile circle tracks, but each approaches the concept of turning left in a different way: Chicago has a “typical” 1.5-mile layout – really more of a ‘D’ shape – similar to Texas, Kansas and Kentucky; Motegi, meanwhile, is egg-shaped, wide open at one end, tight at the other; and finally, there’s the more “traditional” Homestead – two straights connected by two sweeping, 180-degree turns. And so, to Chicago, where the new/old aero package had its second test since being unveiled/reinstated at Kentucky. Could we once again tread that very, very, very fine line between “boring” and “scary” that is known as “thrilling”? Yes. But a couple of times – most notably in the final dozen or so laps after a late-race caution – it teetered, wobbled and generally leaned toward “terrifying” for a bit…. Perhaps the biggest surprise of the weekend was what didn’t happen. Going into the event, a lot of us were convinced that we’d see a press conference/announcement formalizing Danica Patrick’s return to the Michael Andretti-led team currently known as Andretti Green Racing. It all made sense: She’d dropped hints at Mid-Ohio and again at Infineon that the deal was all but done; Chicagoland is the closest IndyCar track to both her hometown of Roscoe, Illinois, and the corporate headquarters of Motorola, her long-time sponsor; and she was scheduled to appear as featured guest on SPEED TV’s “Wind Tunnel” program Sunday night. But, sometime during the days leading up to race weekend, something went at least slightly pear-shaped, and no announcement was forthcoming. Don’t know what, how or why, just yet. Hopefully, it’s being worked out, or has been, as you read this. One thing that DID get announced at Chicagoland was the formation of a new IndyCar team called FAZZT, centered around driver Alex Tagliani. Tags bolted from Conquest following the Edmonton race, and most likely had this deal bubbling in the background at the time as he was joined by ex-Conquest “marketing partner” Jim Freudenberg, who has been involved with several IndyCar teams in recent years, starting with Kelley Racing back in ’00 or so. Throw in financing from a pair of Canadian businessmen – Andre Azzi [hence the team name] and Alexandre Dubresne, and the deal got done. Together, they bought all four of Roth Racing’s cars, its equipment, and – in the most surprising move of all – hired long-time Walker Racing GM Rob Edwards to be team manager and run day-to-day operations. Rob had been with Walker for as long as I can remember – since at least ’95, if not longer – so, for the FAZZT group to hire him away is impressive. In the new paint job department, Dario Franchitti was in a bright yellow “Lifelock” livery that he also planned to run in Japan; while former Andretti Green teammate Tony Kanaan traded 7-Eleven green for a shade of brown for one-off sponsor Oscar Meyer that provided fodder for several rude comparisons. TK himself twittered that he was driving a “Weinermobile” for the weekend. It was another two-day oval “weekend” for us, with practice and qualifying on Friday, and the race on Saturday. ARCA and the NASCAR Truck series were also in attendance, which led to the oddity during qualifying of seeing the towering Michael Waltrip (seriously, this guy is 6-foot-5 if he’s an inch) walking around with Danica Patrick (5-foot-2, MAX) in Pit Lane, and surely setting off a new round of Danica-to-NASCAR rumors in the bargain. Mission accomplished, by both, I’m sure. Another hot rumor in the garage area was “Takuma Sato to Luczo Dragon for Homestead”. Which, apparently, was more-or-less a done deal until Robin Miller got wind and actually printed it (horrors!). Once word got out, Luczo’s team owners got a bit sideways over the premature announcement, so it may not happen now. I guess we’ll find out during the second week in October. In Indy Lights World, with just 16 cars in the field and JR Hildebrand needing only a 13th-place finish or better to clinch the title, the championship fight with impressive rookie teammate Sebastian Saavedra became a bit anti-climactic. Still, with Lights guys (and girls) on a 1.5-mile oval, you NEVER count your chickens before the checkers. Trivia question: When is a “Home” race not really at home? Answer: When you’re Newman Haas Lanigan Racing, and most of your team members live in the northern and northwest Chicago suburbs – an hour-plus (on a GOOD day’s commute) from Chicagoland Speedway. For those of you living in L.A., think commuting from HPD to Disneyland in Anaheim… So, the NHL guys all got hotel rooms in the Joliet area. Yes, kids, the metro Chicago area is spread out ALMOST as much as the Southland. So ends today’s geography lesson. Unlike during the rushed race day at Kentucky, the teams had time to try out different aero options and combinations at Chicagoland. EVERYONE was running the inner rear-wheel covers, but after that, the setups varied considerably. For instance, in use of the kickups in front of the rear tires: AGR’s Danica Patrick and Marco Andretti utilized them, but Tony Kanaan and Hideki Mutoh did not. The NHL cars ran everything -- kickups and sidepod extensions included – but the Penskes were “clean,” without either piece. Ganassi ran the kickups but not the extensions, etc. Finally, with MotoGP scheduled for the same weekend at the Indianapolis Motor Speedway, a bunch of us (yrs trly incld) made the three-hour run south from Joliet to Indy either late, late, late Saturday night (due to the silly 9 p.m. start time for the IndyCar race) or early Sunday morning. It was fun, and I highly recommend that all of you check out the MotoGP scene sometime in the future. On track, the lone practice was uneventful, with the usual suspects up front (Dixon, Briscoe, etc) and at the back (Milka, Jaques Lazier). No yellows, except a single track inspection. So, on to qualifying we went…..
…where it was an all-Penske front row, with Ryan Briscoe on the pole and Helio Castroneves alongside. Franchitti ran third, and the only mild surprise was Dixie a relatively poor sixth. Who was in between? TK and Graham Rahal. For AGR, the long claw back towards respectability, begun at Kentucky, continued, with three cars in the top 10 and Mutoh not that far off in 13th. KV and NHL also continued to inch up on the “Big Two,” with Moraes eighth and Oriol Servia ninth, to go with teammate Rahal. Saturday was Race Day for IndyCars, and Practice/Qualifying/Race Day for the Lights crowd, who, for the second time this season –and first time by design – would have a Sprint-Car-style, one-day show. In a mild upset, USAC racer Brandon Wagner had a nice qualifying run to take the Lights pole, with Saavedra second. Where was Hildebrand? Thirteenth, with fuel pressure issues that also affected several other cars … at least four in all, all of them on different teams. Hmmm, junk in the fuel, clogging up the filters, perhaps? This might get interesting, after all. At the green, Wagner got swallowed up and passed by several cars. His day got worse when he made contact with Pippa Mann while completing Lap 5, losing his right-front wing. That contact caused Mann to spin at Turn 1, which caused Rodrigo Barbosa to spin, as well. Ana Beatriz was lucky to pass the spinning Mann without making contact with the outside wall. Wagner was able to replace his damaged wing, but eventually dropped out with handling issues. This was just the start of the silliness. Mike Potekhen made contact with Daniel Herrington on the back stretch on Lap 32. Both cars continued, but Potekhen was unable to keep his car in the bottom groove and drifted up, making contact first with Beatriz, and then, with James Hinchcliffe. All three cars ended up in the wall and out of the race. 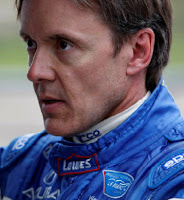 The wreck also meant that Hildebrand had clinched the title – afterwards, there were only 12 cars running, and JR was free to go for the win. The field went back to green on Lap 41, and from there, no one was able to get past Herrington, despite some breathtaking moves in the field. This was a crazy race, with pretty much the entire field running together throughout. James Davison finished second, while Andrew Prendeville made a late charge to finish third. Wade Cunningham recovered from a late drop in the pack to finish fourth, while Hildebrand clinched a well-earned championship with fifth. Here’s an equally quick IndyCar race recap: Dixon had stretched out a big lead over Briscoe after the final round of pit stops, but it was erased in a Lap 184 crash by Helio Castroneves, who hit the Turn 4 fence with vigor following a right-front suspension (pushrod?) failure. With just a dozen or so laps remaining, the final run to the checkers was “big casino” (i.e. a crapshoot), complete with clean passes, some not-so-clean passes, check-ups, slide jobs and even a set of teammates (or two) carving one-another up in the mass scrum to the finish. Briscoe repeated his Kentucky performance, this time eking out a narrow, quarter-of-a-car-length victory over a nonplussed Dixon. For only the second time this season, the points leader coming INTO a race weekend remained the points leader AFTER the event. Moraes completed the podium and emotionally dedicated the run to his late father. The third-place effort was his best career IndyCar finish. In addition to Castroneves, Mutoh also had a hard impact mid-race, when an apparent toe-link failure turned him right into the wall in a crash similar to Kanaan’s impact at Indy. Like Helio, Hideki was okay, too. Even though the team is showing improvement, in general, it was not a great night for AGR. Marco Andretti was their highest finisher, 11th despite causing the second caution of the night when he brushed the wall on Lap 108. Pit strategies backfired on Danica and TK. 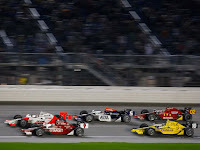 Panther Racing had another forgettable evening, as Dan Wheldon broke a half-shaft exiting his pit during the first caution. This was the kind of track that Panther hired Wheldon to do well at, yet once again, the team wasn't a factor. Meanwhile, NHL continued its upward march, with both cars finishing among the top 10. Rahal finished fifth and looked for a while like he might have something for the leaders, but lost out in the final lap free-for-all. Teammate Servia might have finished even better than seventh if he hadn't made a mistake on his last pit stop that cost him time. At this rate, we MIGHT have a “Big 3” again next year, but with NHL replacing AGR as the third member of the clique. Semi-regular Tomas Scheckter and Justin Wilson also looked good at Chicagoland, perhaps the best the Coyne team has looked on a big oval to date. Ed Carpenter also looked really fast early -- from 12th at the start to sixth by Lap 5 -- but he was another guy to get shuffled back after the last caution. We’re still awaiting final word on the Brazil event location. The latest now has Rio de Janeiro as the leading candidate, ahead of the northern resort town of Salvador. I just want to see something – anything – formally announced. Likewise, regarding the issue of a series title sponsor: The League claims to have two potential candidates lined up. It’d be nice to close the deal on one or the other – soon. It’d be a great way to end the season on a positive note. Forget about Milwaukee for 2010, so we’re just about out of short ovals for now. Only Iowa is left, and it’s so high-banked that you don’t see the cars slide around like they did at Milwaukee and Richmond. And that’s a shame. We need Milwaukee and tracks like it (Phoenix, Richmond, New Hampshire) to truly have a diverse schedule. Injury updates: Both Will Power and Nelson Philippe continue to recover nicely. Vitor Meira is just about ready to go (update – he tested at Indy on Oct. 2), but won’t run Homestead now. The Foyt team doesn’t have the manpower or equipment to run a second car in the event. All should be back, either full- or part-time, in 2010. The Versus – DirecTV squabble continues, even into the start of the NHL season, where Versus is the primary carrier. What may finally settle it? Well, there is a rumor making the TV industry rounds that Versus’ parent company, Comcast, is about to purchase a controlling interest in NBC from General Electric. That might shift the balance of power in this pxxxing contest.